Jack is a chef, a writer, an activist and – since taking part in Veganuary 2016 – a vegan. These Not Meatballs are a firm favourite in the Monroe household, and they’re sure to be in yours too. 1. Cut the stems off the ends of the aubergines and halve lengthways. Dice the flesh into small pieces and pop into a medium non-stick saucepan or frying pan. 2. Peel and finely slice the onion and garlic, chop the chilli as finely as you can and add these plus the olives to the aubergine in the pan, along with 1 tablespoon of the oil. Cook on a medium heat for about 10 minutes to brown and soften. 4. Shape the mixture into tablespoon-sized balls with your hands. 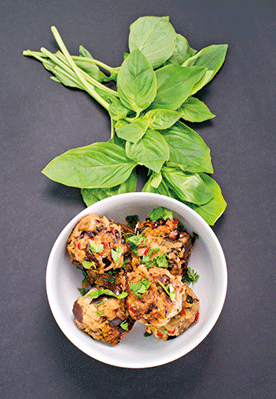 Put the remaining 2 tablespoons of oil in a frying pan and carefully fry the aubergine balls in batches until browned all over. Remove with a slotted spoon and serve with extra lemon juice and torn basil to taste.